Welcome to Indie Author Month hosted by Never Too Old for Y.A. & N.A. Books group from Goodreads. 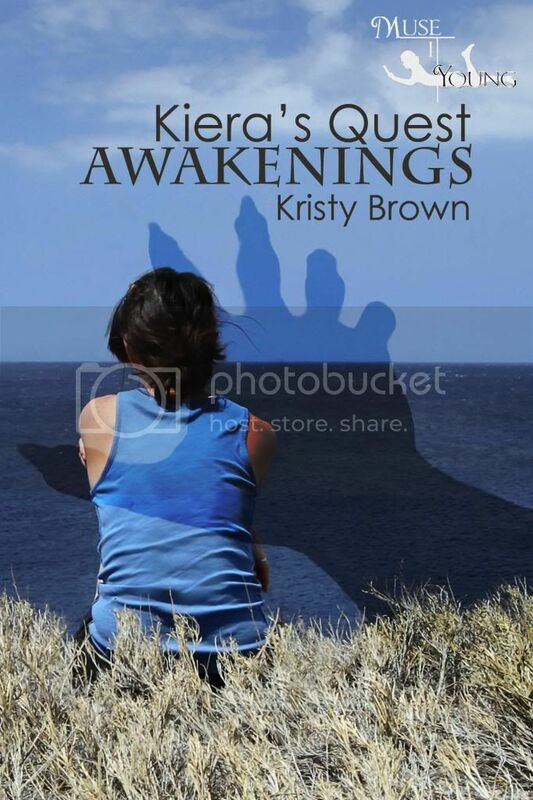 Today, for author Thursday, we welcome author Kristy Brown! So, let's hear what Kristy has to say! I actually wanted to be an actress! I trained at various performing arts schools. I gained an honors degree in contemporary arts. After doing a bit of theatre and going for many auditions, my passion for it all faded. I met my husband and we had our first child. I started writing when he was a baby. I’ve always written poetry and short stories. The first “Kiera’s Quest-Awakenings,” took a few years. I was new to it all and I was also bringing up a baby. Book two “Sacrifices,” took a year. Book three “Perceptions,” was a lot quicker at around seven months. Well, book one simply came about when I was staring at my niece’s doll’s house one day! The rest of the plots followed on easily. The next book I write, after Kiera’s Quest four, will be based around a dream I had! Yes, when my kids are at school! I need total silence. When my boys were younger, it was a matter of grabbing time whilst they slept etc. Nowadays I work when the urge takes me. Great, relatable characters, plot twists, colourful worlds and laughter. Getting it out there to the readers. There are so many talented writers to compete with. I’m on book four, the last in the series. Not sure I have a favourite, they are all so different. I do love writing the Witch Queen’s parts. She is so twisted! I also pour a lot of me into Daz. He is very dry in his sense of humour. Normally at my kitchen table. They love them. I have never seen my dad so enthusiastic about a story! My husband is always the first to read them; he is great and very honest! I love spending time with my kids. Reading. I like the cinema. I am blessed with fantastic friends. Go for it! If you have a story inside you, write it. If you believe in it, someone else will. There are so many! I guess as a child Roald Dahl was a firm favourite. The book that touched me recently would be The Hunger Games. I never ask for help with story lines, as I need to feel that it’s my work. But my hubby and editors at “Muse” are my go to people. Yes, I’m writing the last book in the Kiera’s Quest series. I feel a little sad that Kiera and her friends are coming to an end, but I have so many more stories to tell. Thanks so much for being here today, Kristy! And now, a little excerpt teaser from Kristy's book! Zakk felt his throat grow tighter, barely able to breathe. Sweat dripped from his brow. Suddenly, the vice gripping his throat loosened and discarded him to the ground like a crumpled tissue. Maybe an apology was all that ‘it’ needed. Minutes passed, feeling like an eternity. All seemed quiet in the icy air. He dared not move. Zakk tried to collect his thoughts and regulate his breathing. In and out… in and out slowly, he told himself. He tried to catch a glimpse of his jailer, but couldn’t see past his own shadow. There was a definite presence watching him, enjoying the show. A wave of emotions passed through him; pain, loneliness, emptiness, dread, but most of all fear. They seeped into him, like black ink coursing through his veins, devouring his consciousness. For the first time in his life, he felt totally alone. He knew if he could scream, no one would come. If he tried to run, his legs would not aid him. “Who are you?” Zakk whimpered. This voice somehow seemed strangely, and uncomfortably, familiar to him. The voice broke into a spine-chilling laugh. “Don’t you know?” it mocked. “Look hard, deep into yourself. You know who I am. I am your darkest fear when you close your eyes. I lie in wait at your very core. Who am I?” The voice seemed outraged not to seem significant in Zakk’s life. Zakk nervously fiddled with the dull glass ring on his middle finger. It had belonged to his mother, and just touching it reminded him of her warm smile, her golden silky hair and the lullaby she sang to him to tuck him up each night. Silence fell upon him again. He felt deeply saddened, but immensely angry. If he was going to die here in this cave, he needed to know. Zakk spoke calmly and evenly, trying not to annoy his captor. “I should have ruled this world. I should have been Queen. She was useless. I will do better. I should have been at your father’s side. She never loved him.” She spat out her words as if they were poison. “But you did?” Zakk asked, even more confused. “You loved my father?” Surely she was not capable of such an act. “She was tossed from one to the other, like a little raggedy doll,” she sang, with great malice and delight. Zakk, now broken, wept. He could no longer hold the tears at bay and gave in to his despair. He pictured his mother’s gruesome death, and melted into a pool of sorrow. The Witch Queen poked her spindly leather finger into Zakk’s cheek, but she was still covered by the veil of darkness. Watching his tears run down her long, ugly finger, he noticed a very familiar glass ring at the end of it. Shaking his head in disbelief, Zakk looked again recognising his father’s ring. Time slowed down in his mind. Sweat gushed down him like rain. “Father!” he cried. “Father?” Zakk knew his only response would be that of his own echoes chasing each other round the stone cave walls. “He’s gone,” she said, stepping a little closer so he could just make out her eyes. He searched them wildly for a hint of compassion, but there was none to be found. Like hard coal they were dead inside. “No, no,” pleaded Zakk, kneeling on the floor with his arms clasping his chest. He held on to all he had left. Himself. Immediately, as if from nowhere, flames bolted toward him. Bright reds and dancing oranges licked at his heels, engulfing him. Zakk raised his hand to shield his eyes. This is it. I am finished. I couldn’t save my family, or my people. I am nothing, he thought. At that moment, something happened. The air directly around him cooled. He opened an eye, feeling safe from the heat. Zakk looked up. A force of light surrounded him, bringing the fire to a halt. Bizarrely, the force poured from his mother’s ring, which now shone all the colours of the rainbow. In her own way, she still watched over him, and protected him. He felt the wrath of the Witch Queen lift from him. Love glided back through his veins once more. Zakk slowly rose to his feet, feeling strangely confident. His new resolve seemed to anger the Witch Queen further. She tried once again to execute her enemy, throwing arrow upon arrow of flesh stripping fire, but to no avail. Her efforts bounced off him, like raindrops on a pond. A high-pitched squeal and a flash of white light and Zakk began to fall. He couldn’t feel his body or open his eyes. There were no sounds. The heartbeat pounding in his chest moments ago, fell deathly silent, and all went black.